The wreck of the schooner Swiks that grounded on an offshore sandbank outside northern Oland, Sweden, one hard winter night 1926. The wreckage was blown ashore in a storm 1954. This is what is left. hd00:17The wreck of the schooner Swiks that grounded on an offshore sandbank outside northern Oland, Sweden, one hard winter night 1926. The wreckage was blown ashore in a storm 1954. This is what is left. hd00:32The wreck of the schooner Swiks that grounded on an offshore sandbank outside northern Oland, Sweden, one hard winter night 1926. 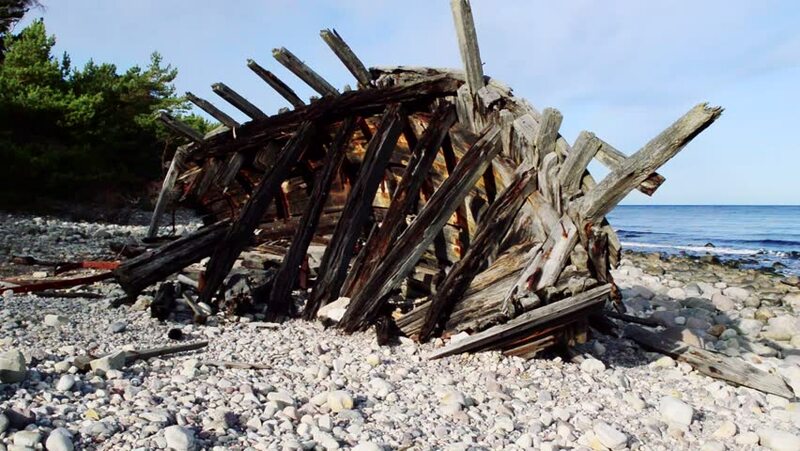 The wreckage was blown ashore in a storm 1954. This is what is left. hd00:10Wood burning in a campfire on the sandy beach. hd00:46Two men in military uniform sitting at a table of logs in a transit camp in the woods. They discuss their route and drinking tea near the fire.